Are you a slots game fan? Do you prefer silence to words? Then you are in the right place. There is a new slot game from NetEnt called the Emoji Planet. We all love the funny features that are often on the phones and that we tinker with on WhatsApp or SMS. Did you know that those tinny features on your phone are a gateway to big money online? 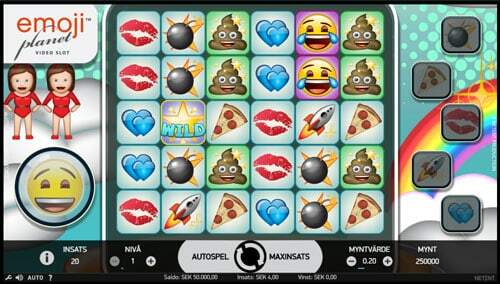 Emoji planet has a theme based slot game that suits all ages above 18 of course and it is so simple to use that making the money will seem like a steal. NetENT which was founded in 1996 in Sweden formerly went by the name Net Entertainment. This company prides itself on being the lead provider of all gaming solutions primarily to online casino operators. Their mission is mainly to ensure that all the gaming casinos affiliated with them are always ahead of the times. It is here where millions of dollars in prizes have been won and now they have jumped on the Emoji bandwagon. This is an online slot game that operates around coin value and level selectors. It begins with an upbeat music track that is funky and fun. The game’s interface has a very busy mobile themed background. The bets are manageable with the minimum amount a person can bet in this game is 0.20 with a ceiling of 200. The game has an avalanche theme where the symbols do not spin rather they fall into place if you trigger 5 or more symbols vertically and horizontally then you win and if they are more than five, your payout is bigger. The 5 meters all have unique purposes and they can only be activated when the right symbols are filled on the right side of the reels. If you get ten correct symbols you are rewarded. For example, if you fill the Pizza meter, a 3 x 3 block is triggered. This block needs to be filled with any random symbol but not the wild. The Heart meter multiplies the current bet minus one of the number of times you were able to fill the meter. The rocket meter, on the other hand, adds to the reels a stack of 10 star wild symbols. When you fill the kiss meter you add to the reel three sticky wild cards which stay in place until you score three combos. The bomb meter is the hottest and filling it means that eight random symbols will explode on the reels and the player is awarded between 5 and 100 multipliers on your bet for every symbol that is blown up. Apart from the great payoffs which can go up to 5,000 times your initial stake, the game is easy to play ones you get the hang of it especially for those who find emojis entertaining. All in all, this 5- reel and 6-row video is perfect for the fun loving people.